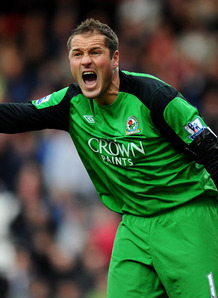 Tottenham are weighing up a shock move to bring Paul Robinson back to White Hart Lane. Robinson, who left Spurs for Blackburn in the summer of 2008, has been in superb form for Rovers this season and has played a key role in helping them to seventh spot in the Premier League. The 31-year-old's performances have not gone unnoticed by former club Spurs with Harry Redknapp still unsure over his goalkeeping options at the club. Heurelho Gomes is currently No.1 at White Hart Lane, but it has been suggested Redknapp is yet to be fully convinced the Brazilian is the long-term solution between the sticks. Carlo Cudicini is out of contract at the end of the season and he could leave the club after failing to establish himself in the side. Blackburn are determined to keep Robinson as they plan for the future and they are thought to have opened talks with the former Leeds man about a new deal at Ewood Park to ward off potential suitors. Tottenham are thought to be monitoring Robinson's situation at Blackburn with the shot-stopper recapturing the form that made him England's No.1 keeper.